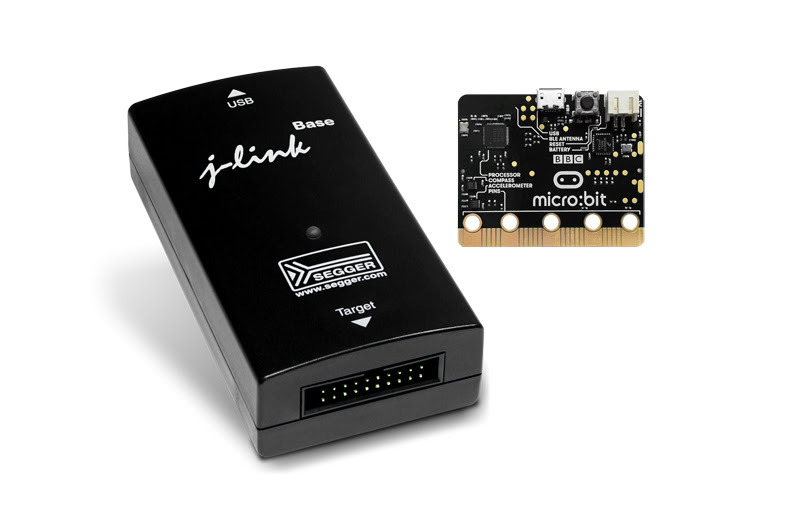 SEGGER has introduced J-Link support for the low cost BBC micro:bit embedded board providing developers a path to using a production grade IDE for their next project. SEGGER offers the capability to upgrade the firmware on the BBC micro:bit DAPLink to a J-Link OB (On Board). This firmware makes the on-board debug solution on the BBC micro:bit compatible to J-Link, allowing users to take advantage of all J-Link features such as ultra fast flash download and debugging speeds and the free-to-use GDBServer as well as application development using an IDE. “Adding J-Link debug capabilities to the BBC micro:bit broadens its exposure to an even larger audience. The micro:bit eco-system is improved significantly by making professional tool options available to developers,” says John Leonard, Product Marketing Manager at Nordic Semiconductor. J-Link is supported in all major IDE’s; IAR EWARM, Keil MDK, Rowley Crossworks, SEGGER’s own Embedded Studio and other Eclipse/GDB based offerings. This gives students and developers flexibility in their choice of IDE. The SEGGER J-Link is the most popular family of debug probes on the market. It is tool chain independent and works with free GDB-based tool chains such as Embedded Studio, and Eclipse, as well as commercial IDEs from: Atmel, Atollic, Coocox, Cosmic, Freescale, IAR, KEIL, Mentor Graphics, Microchip, Phyton, Rowley, Renesas, Tasking and others. With the J-Link family, investments in the debug probe are preserved when changing compiler or even CPU architecture. J-Link supports multiple CPU families, such as ARM 7, 9, 11, Cortex-M, Cortex-R, Cortex-A as well as Renesas RX100, RX200, RX600 and Microchip PIC32; there is no need to buy a new J-Link or new license when switching to a different yet supported CPU family or tool-chain. SEGGER is also continuously adding support for additional cores, which in most cases, only requires a software/firmware update and unlimited free updates are included with even the baseline model of the J-Link family. All J-Links are fully compatible to each other, so an upgrade from a lower-end model to a higher-end model is a matter of a simple plug-and-play.